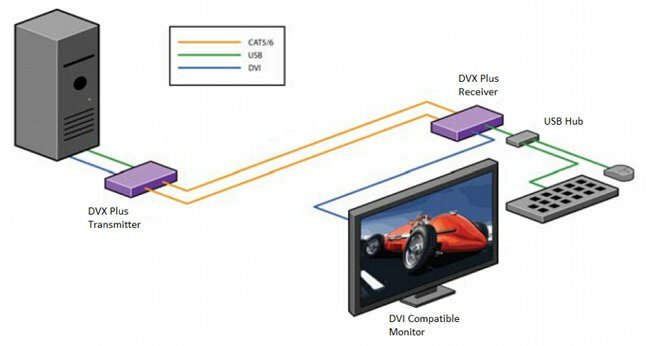 DVX Plus extends Universal Serial Bus (USB 1.1) and Digital Visual Interface (DVI) signals via common twisted pair cable. Using a unique method of transparent data transfer, the system allows a USB peripheral and DVI to be located up to 225 feet (68m) from the CPU. Extends USB and DVI signals up to 225ft (68m) from the computer. Uses easy to install, inexpensive twisted pair cable. Data recovery for digital video. Supports 1920x1200 digital video resolution. Supports 1.5 and 12 Mbps data rates. External power adapter for transmitter and receiver unit. Fully transparent (does not use any emulation). DVI-D/USB CAT 6 STP Extender.